Last week we took a little side trip into the Gospel of John where the Gospel writer chose as the first story he told about Jesus’ ministry the one in which Jesus turned water into wine. The author wanted us to get a joyful taste of the super abundance of God’s grace that is revealed in Jesus, here, now. Each Gospel writer tells the story of Jesus differently, and now we are back in Luke’s Gospel which is the primary Gospel we’ll be following this year. Luke chooses the story you just heard to lead off with: following Jesus’ baptism and the infusion of power he received through God’s Spirit of God, and then his time in the wilderness, we hear how Jesus, full of that same Spirit returns to the region of Galilee where he begins making quite an impression as he wanders from town to town. Luke quickly summarized this before slowing down to tell the story of Jesus’ return to his home town: how on the Sabbath as was his custom Jesus went to the synagogue, and the local people, having heard of their local boy’s growing fame invited him to do a little preaching. Now in those days the preacher would sit down to preach which is what Jesus did. And every eye was on him waiting with baited breath to hear the sermon he would give. Our reading ends there, but next week we will hear how in the sermon ’talk back” that immediately commenced Jesus started arguing with the folks and they got mad enough to kill him. But today let’s just focus on this opening message. Although unlike John’s story of the wedding at Cana, Luke’s first story calls to mind the suffering of this world, and yet it is similar in that at its essence it is a message of joyful hope. It was a time when hope was hard to come by. The Roman oppressors ruled the land. But in this time of deep darkness Jesus begins his ministry with a joyful note of hope. 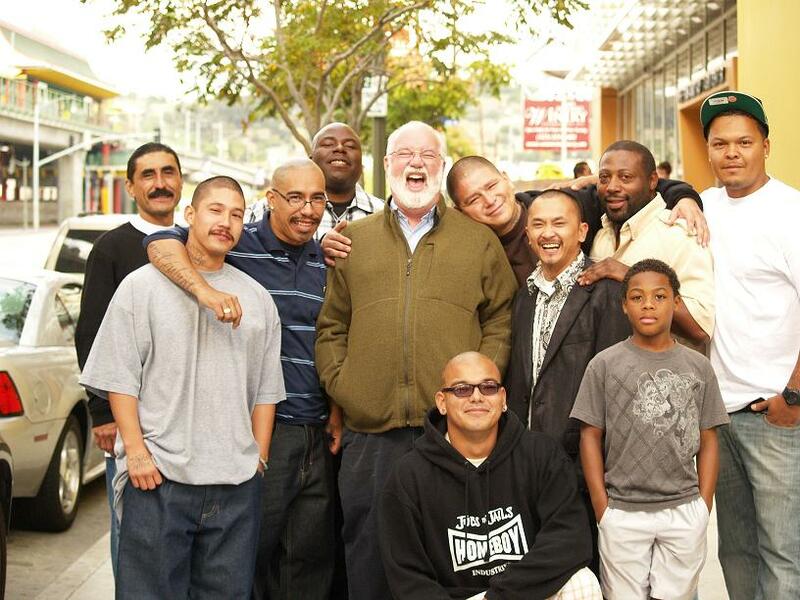 I listened again this week to an interview of a wonderful Jesuit priest named Father Greg Boyle who has been working for forty years in a section of Los Angeles known for extreme gang violence. He has by his own count buried nearly 200 young people – some who died from overdoses but the majority through gang violence – young people he had come to know and love. Oftentimes they had been murdered by young people he had come to know and love. He lives and works in a setting that most of us would imagine to be unbearable, full of poverty and oppression and rampant incarceration — and yet one of the striking things about Greg Boyle is how funny he is – how light-hearted his spirit is in spite of the sorrow he has felt and the pain he has witnessed. He is, in that sense, the living embodiment of the spirit of the story John started his Gospel with – that of a wedding feast with a superabundance of the very best tasting wine. Father Boyle said that when he first arrived in the parish he serves, he set out to try and be a peacemaker between rival gangs. It was a noble goal, but eventually he came to the conclusion that to focus on peacemaking was ultimately misguided because it was based on the wrong premise. The violence between the gangs wasn’t actually about conflict. If you come at it with the model of the Middle East or Northern Ireland you misunderstand what’s going on. So over time his ministry shifted its focus — they started something called “Homeboy Industries” — small businesses such as bakeries provided jobs for young people that allowed them to move out of gang life — side by side with former enemies – former members of rival gangs. He said 80% of the solution for these young people was simply having a good job. The other 20% was learning relational skills which involved healing the psychic wounds they carried, and so over time they added to their ministry therapists who provide therapy, individual and group, where these young people could begin talking about what they had been through in life and thereby release some of the pain. In the interview Father Boyle mentions how recently he had been studying deeply the Book of Acts, the New Testament book Luke wrote after he finished his Gospel of the life, death and resurrection of Jesus. Acts tells the story of the early church, and just as in his Gospel, the Spirit of God is the primary active agent. And then Father Boyle proceeded to tell a story. Recently he had given a talk at a seminar for 600 social workers being trained to work with gangs. He said he brought two “homies” as he calls them. One was Jose, a tattooed man in his late 20s who works in their ministry with people suffering from substance abuse. Jose had been a heroin addict and a gang member and is now in recovery. The whole audience gasped, and then Jose said, “It’s sounds way worser in Spanish,” and then they laughed. Father Boyle paused as he told this story and highlighted the fact that Jose was never seeking anything when he turned to heroin or joined or gang. He was fleeing the pain of the story he was telling. Father Boyle points out how easy it is for folks like us to pass judgment on people whose lives go off the rails like this. But when you hear the stories like this — stories of far greater pain than most of us have known — and in particular when you hear a story in which somehow through the Spirit of God a person has found the courage and faith to turn towards the light and away from the darkness, you can’t help but stand in awe. In the interview, Father Boyle was asked how it is that he can carry such a light spirit while he works in the midst of such pain. He explains that it is because on a regular basis he experiences such awe. Father Boyle said that people have it wrong when they look at him as being some kind of great saint who goes to these bad kids to share his goodness. No, he says, it really is a two way street. In fact, he is certain he has received far more than he has given. He tells another story about wandering through the projects late one night when he came upon this sixteen year old kid named Mario just sitting alone on his little stoop in front of the crummy old projects. Mario has a back story with a lot of similarity to that of Jose. And Father Boyle described how awestruck he was – with the presence of a God of a superabundance of grace – a God so much bigger than the little vindictive, rule obsessed gods we are inclined to imagine. In the interview Father Boyle was asked about his own experience ten years earlier of having been diagnosed with leukemia which led to a course of chemotherapy to become cancer free, and how the experience had affected him. And he said that it was an experience that — as uncomfortable and difficult as the experience of chemotherapy was – he wouldn’t trade for the world. That it created the opportunity for extraordinary intimacy and mutuality with the young people he worked with, allowing him to be the recipient of so much tenderness and concern on their part – something he would always treasure. During his illness Father Boyle received guidance from some early Christians way back in the third century who came to be known as the “desert fathers and mothers” who left the cities to go live a life of prayer out in the wilderness. In the distressing times of his cancer journey Father Boyle had found this prayer mantra helpful: “Today.” Be present, here and now, to this moment, perhaps to the person standing in front of you. Today, in this moment, now, if our eyes are open, our hearts are open, God’s Spirit is present, setting the captives free, releasing the oppressed. Returning us to ourselves. And suddenly as Glenda is looking at Diane Keaton is was as if something dawned on her: there was this moment when something dawned on Glenda as she looked at Diane Keaton. We all captives together, and the Spirit of the Lord is at work setting us free. We’re really all in this together – all of us are in various ways wounded in ways that keep us from being the people God made us to be – unable to give our true selves away in love. And the beginning of the Spirit’s healing of these wounds is finding the courage to bring them up into the light of day. And all of us are oppressed in some form, and some of the oppression comes from outside of us, and some of it comes from inside of us – but God is at work leading us towards the glorious liberty of the children of God. We are together the Body of Christ, anointed by the Spirit to come to that place where we can love our wounds and so they can be the source of compassion to the woundedness of others – all others. ??????????????????????????????????????????????????????????????????????????????????????????????????????????????????? ?